If you miss the days of bumping around Capitol Hill in the first generation miniature Car2Go “Smart cars,” you are in luck. Bike share company Lime is set to build on its fleet of electric bikes with a new fleet of tiny electric cars in Seattle. The Puget Sound Business Journal broke the news last week that the company has applied to enter the city’s car share market. In July, Lime hired Peter Dempster, who had overseen ReachNow’s launch in Seattle, to run its car-sharing business. Dempster said Lime hopes to shift its car-sharing fleets to electric vehicles, but said the logistics of charging the vehicles made electric cars unsustainable for now. Like bike- and scooter-sharing services, free-floating car-sharing services require operators to monitor the fleets and rebalance them, so that vehicles remain available in the areas where people are looking for them. For scooters, Lime has used both paid staff members, and “juicers,” people it pays a per-unit rate to charge and redeploy the vehicles. A proposed cutback on the city’s Law Enforcement Assisted Diversion program that expanded to SPD’s East Precinct on Capitol Hill in 2016 will be restored in proposed changes to the Seattle budget put forward by the City Council this week. District 3 representative Kshama Sawant sponsored the proposed $150,000 budget line item’s “green sheet” addition to the 2017 spending plan. This Green Sheet would add $150,000 GSF in 2017 and $150,000 GSF in 2018 to the Human Services Department (HSD) for the Law Enforcement Assisted Diversion (LEAD) program. LEAD expanded to East Precinct in 2016; this funding would keep LEAD’s City-funded portion of its budget at the same level ($960,000). LEAD is a pre-booking program that places qualifying drug use suspects into counseling instead of jail. CHS wrote about Mayor Ed Murray’s 2017-2018 budget plan from a Capitol Hill perspective here. Council members have bristled at the mayor’s plan to slice back LEAD spending as well as his homeless spending plan. Below are eight tweaks to the mayor’s plan being carried forward by the council members. You can take a look at all 104 proposed budget updates here. Mayor Ed Murray and City Council member Mike O’Brien test drove an electric vehicle this week to celebrate progress on Seattle’s electric car initiative, a plan that includes improving the infrastructure for EVs, electrifying the city’s own vehicle fleet, and continuing Seattle’s ongoing conquest to cut carbon emissions and pollution from transit. Amid the massive overhaul of the 23rd Ave corridor and the uproar it’s caused with local merchants, another project on the street has quietly got underway: building the infrastructure necessary to transition the route 48 diesel hybrid busses into a fleet of all-electric trolleys. Connecting the U-District to Mt. Baker through the Central District and Capitol Hill, the 48 is the workhorse of 23rd Ave transit, shuttling riders the entire length of the corridor. Much of 23rd Ave has overhead wires to accommodate the 4 and 43, but the 48 has to run diesel hybrid busses due to gaps in the line. There are currently 1.7 miles of missing overhead wires needed to run electric trolleys on the 48, with gaps from John to Cherry, and Dearborn to Plum. The Seattle Department of Transportation, which is handling funding and construction for the King County Metro line, estimates the project will cost $14.6 – $17.5 million, with $9.4 million already secured through federal grants. Construction will include installing trolley poles, overhead wires, and traction power sub stations. The second phase of the project is expected to get underway next year, setting up the 48 to go electric in 2018. There are clear environmental benefits, too. With its 4 miles per gallon busses, the 48 route uses roughy 185,000 gallons of diesel fuel a year. Electric trolley bus technology was found to be $3.7 million cheaper annually than diesel hybrids, according to an SDOT study. Electric trolleys will also significantly reduce noise along the busy corridor. Car sharing in Seattle is getting an upgrade. BMW Group officials were on Capitol Hill Friday morning to unveil their re-booted and re-branded free floating car share service which will add all-electric BMW i3s and non-electric 3 Series and Mini cars to the city’s mix of park-anywhere vehicles. ReachNow is the first competitor to Car2Go’s Smart Car fleet since Daimler AG rolled out the service in 2012. The official ReachNow launch includes a nod to BMW’s pre-app days — an event at the Pike Motorworks building, a former BMW dealership. BMW officials were planned to be joined by Mayor Ed Murray to announce the company’s re-start of U.S. operations, which includes opening a new headquarters in Seattle. Officials say they plan to expand service to several other cities this year, but chose Seattle for its headquarters because of its environmentally conscious consumers and electric vehicle-friendly infrastructure. CHS will be updating here with more details from the event. UPDATE: “Have a BMW for the weekend,” is how BMW executive Peter Schwarzenbauer pitched Seattle’s new car share service Friday morning. i3s, 3 Series, and Minis were parked inside and trotted about outside the Pike Motorworks building on E Pike to show off the ReachNow fleet, which is now available for rides. During the event Schwarzenbauer highlighted some of the “premium” services that will go above the traditional care share model. Among the most innovative is allowing BMW and Mini owners to earn money by putting their own vehicles on the ReachNow network. Just how much car sharers will be compensated is still getting worked out. Details were also scant on some of the other promised features, like how service to SeaTac Airport will work and when ReachNow’s service map will expand to more Seattle neighborhoods. Users can drive outside the “home area” but cannot end trips there. Schwarzenbauer said when all its services roll out this year, ReachNow would clearly stand apart from Car2Go. It’s been a big couple days for changing the way people travel to and from Capitol Hill. Last week, Mayor Ed Murray announced Drive Clean Seattle, a new city initiative to improve infrastructure for electric vehicles (or EV’s), electrifying the city’s own vehicle fleet, and continue Seattle’s ongoing conquest to cut carbon emissions and pollution from transit. And for current and aspiring electric car owners on Capitol Hill, the initiative brings good tidings of city investment in encouraging their green wheels. “We will work with residents, transit agencies, and businesses to promote the use of Seattle City Light’s carbon neutral electricity to move around the city. Transportation is Seattle’s leading source of greenhouse gases and this plan will allow us to work aggressively to reduce climate impacts,” Murray said in a statement. The initiative has some high-reaching goals with three major components. The first is to “lead by example” and reduce carbon emissions from the city’s vehicle fleet by 50% through investing in more fuel efficient and all-electric vehicles and figuring out ways to cut car idle times. Then there is Murray’s stated goal to “enable and support the adoption of 15,000 electric vehicles by 2025.” This, Murray says, will be achieved by tripling the number direct current (DC) rapid charging stations in the city for all electric vehicles— like the Nissan Leaf, the Mitsubishi i-MiEV series, and the famed Tesla—on both private and public property as well as exploring different ways the city can help finance and install residential home charging stations, starting with two pilot projects: an on-bill repayment system for the installation of residential charging stations and time-of-day-pricing for the actual charging. All of these proposals are still in the conceptual phase. The city doesn’t have any hard numbers on either the cost of the various public investments — save for DC fast chargers, which are estimated to cost between $50,000-$80,000 for installation, operation and maintenance—nor the nuts-and-bolts technicalities of the proposed pilot projects. But the city wants you to be stoked anyways in the meantime. “It is the most comprehensive plan that we know of to increase the electrification of our transportation system and to reduce carbon pollution,” said Jessica Finn Coven, director of the city’s Office of Sustainability and Environment. There were no ribbons to cut or long speeches when the First Hill Streetcar shoved off from Pioneer Square for its inaugural passenger journey to Capitol Hill Saturday, but the rain-soaked launch delivered where it counts: regular service started without any major hiccups. Demand on the sunny Sunday that followed was large enough that officials pressed an extra car into service to deal with the crunch. It’s been a long time coming. September 1, 1940 was the last day that streetcars carried passengers on Broadway and down Harvard Avenue. Speaking inside a crammed train car at the Occidental Square stop Saturday, Mayor Ed Murray distanced himself from the FHSC project’s many delays but said he was excited to take part in the first trip to his home neighborhood on Capitol Hill. The opening is the first in a series of massive transportation projects opening in 2016 around Capitol Hill including an April debut of the new 520 floating bridge and the March opening of light rail and the Capitol Hill Station facility which is expected to serve more than 10,000 riders a day at Broadway and Denny. Across the street from the soon to open light rail station, Saturday’s start of service (CHS Coverage!) for the First Hill Streetcar marked a decade of work to get the line operational. In January 2006, the Sound Transit board authorized staff to begin planning for a possible new streetcar line after it had taken a First Hill light rail stop off the table because of the risk and expense it determined would be involved in creating the station. At nearly a billion dollars over its lifetime, Proposition 1, or Move Seattle, a $930 million dollar dollar property tax levy spanning nine years to fund transportation infrastructure throughout Seattle, dwarfs any other transportation investment Seattle has seen before. So, what’s in it for Capitol Hill and District 3? Move Seattle will pick up where its predecessor — the $365 million dollar Bridging the Gap transportation levy which is set to expire this year — leaves off. Since its enactment nine years ago, Bridging the Gap has funded nearly twenty-five percent of the Seattle Department of Transportation’s budget. Those levy funds were spent conducting basic transit infrastructure maintenance like repaving streets and replacing street signs, as well as beginning investments in infrastructure for alternate transportation modes such as Broadway’s current protected bike lane. SDOT has a handy map of successful projects financed by Bridging the Gap. Move Seattle continues this basic maintenance work, with an extra emphasis on accommodating growth and reducing congestion by accommodating all modes of transportation on Seattle’s streets. “We are growing pretty quickly,” says Shefali Ranganathan, a Capitol Hill resident and deputy director at Transportation Choices Coalition, a non-profit transit advocacy organization that is backing Move Seattle. Everyone knows Ranganathan’s not exaggerating. After adding 14,000 people in 2014 alone (and 100,000 over the last twenty years), Seattle is expected to add 120,000 new residents in the next twenty years. And with that has come increased traffic. 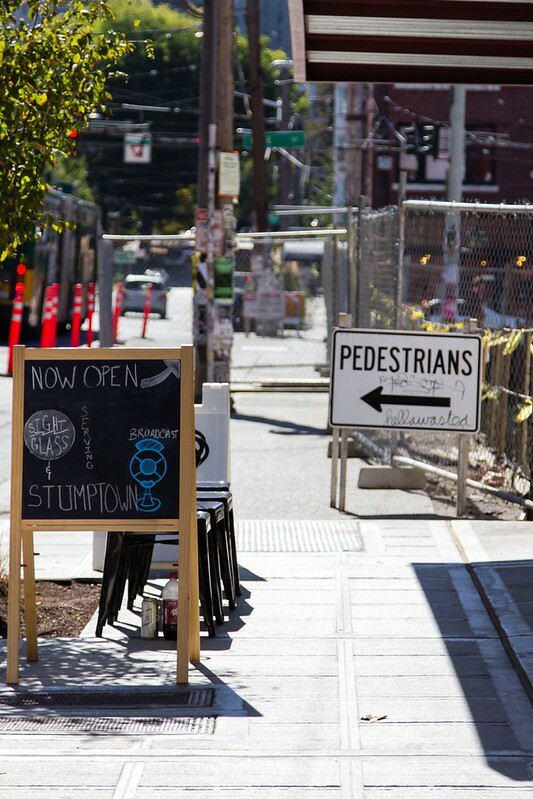 Earlier this year Seattle was ranked as the 5th most congested city in the U.S.
“Sidewalk closed” signs are ubiquitous in boom-era Capitol Hill. A proposed rule change by the Seattle Department of Transportation would limit those sidewalk closures by making construction crews prove that closing a sidewalk is the absolute last resort to getting its work done. You may comment on DR 10-2015 (it’s official gov name) up through October 29, 2015, by sending an email to leanne.nelson@seattle.gov, or calling 206-684-3897. “This new rule means fewer people walking into traffic or zigzagging across intersections on their way home,” said Seattle City Council member Tom Rasmussen, chair of the transportation committee. As the Seattle Bike Blog notes, the new rules do not specifically outline how to manage bike lane closures. The rules do give SDOT the right to evaluate bike traffic impacts, but they don’t go as far as mandating and specifying temporary bike lanes in construction zones. Meanwhile, Mayor Ed Murray is working on the Vision Zero plan to end traffic fatalities and serious injuries in the city by 2030. Part of that plan will include creating more pedestrian friendly corridors. You can read SDOT’s proposed rule change here. 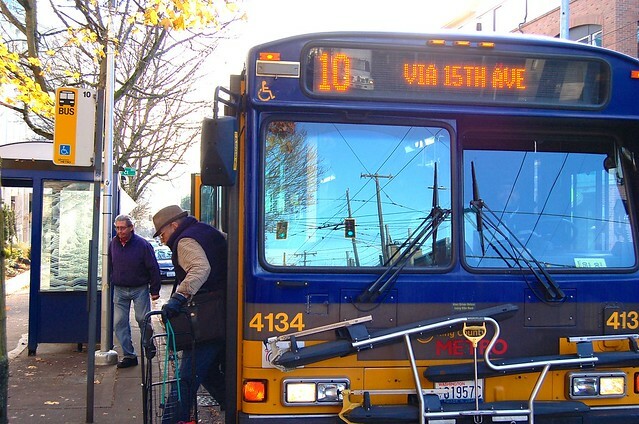 The 10 saw added service in June. This week, almost all other bus routes follow. This week, the second phase of increased bus service in Seattle begins, funded through Prop 1 after it was approved by voters last November. In June, Seattle transit riders saw the groundwork laid for a large increase in service, but it is this week that we are seeing the majority of added trips on bus routes around town.